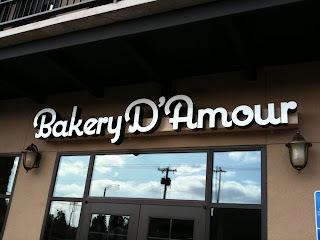 ~Bakery D'Amour is now closed. By Vegans Nightmare - Just across the parking lot from French Press, the Bagel 2000 is about to make its debut in Salem. Mrs. VN and I stopped by the window of Bakery D'Amour to check out the menu and peek in at the progress, and were greeted warmly by the owner (also the owner of French Press) who opened the door, invited us in, and offered us and another investigating couple a quick tour behind the scenes. Some notable notes: The Bagel 2000 is a cool bagel-making machine that makes approximately a bajillion bagels an hour. He pressed the big green button and we watched as the conveyer belt started-up and the contraption started twisting and turning. The owner also proudly showed us his Swiss-made croissant making machine that folds the dough and butter 20(?) times (fat-free I assume). We also received a tid-bit of buttery gossip that one of the reasons the Little Cannoli Bakery is for sale is because Tim Goods has found greener pasture at Bakery D'Amour. This new bakery will be supplying baked goods for French Press as well as another business in downtown (I'm not entirely clear on which one). The owner hopes to supply baked goods for other local businesses as well. Bakery D'Amour may open as soon as next weekend, possibly Friday or Saturday (8/28-8/29). Click here for more sneak peek pictures! Oh! So now I'm understanding! Glad to hear all is good and fine with Tim, but now we wait to see who will buy LC. Oh, I can't wait to try the bagels AND the croissants. We need more of both of those -- good ones, anyway! Are the bagels boiled before they're baked? I hope the new bakery carries Tim's "little" cannolis. They are the BEST! They will carry everything that Little Cannoli carried and more. Tim was pressed for space in the Underground and we wish him well although the wonderful smells, his contant singing and cheerful smile will be deeply missed. Hey Johanna, Awesome! 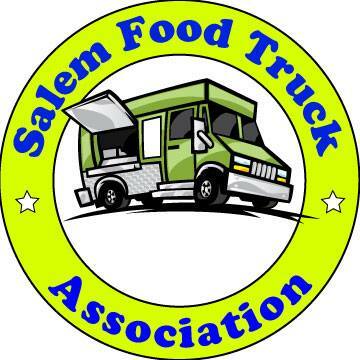 So downtown's loss is south Salem's gain? Tim must really be looking forward to that new space. The cannoli is a fried, tube-shaped pastry shell (usually containing wine) filled with a creamy amalgamation of sweetened ricotta cheese, chocolate, candied fruit or zest, and sometimes nuts. Although not traditional, mascarpone cheese is also widely used, and in fact, makes for an even creamier filling when substituted for part of the ricotta, or by itself. However, cannoli can also be filled with pastry creams, mousses, whipped cream, ice cream etc. You could also add your choice of herbs, zests or spices to the dough, if desired. Marsala is the traditional wine used in cannoli dough, but any red or white wine will work fine, as it’s not only added for flavor or color, but to relax the gluten in the dough since it can be a stiff dough to work with. I see the pastries are finally looking great, and tasting great as well. LOVE the lemon cheesecake, and the Napoleons are different and more of what I'm used to. The salted caramel cupcake I had is to die for. Keep up the good work bakery. Looks like the fake stuff is finally going away. Now get back to the real cake I had a month ago. It was some peanut butter cake that was wonderful. Also a pear tart with bleu cheese, very good indeed. OMG the pastries are not that great. Soggy eclairs, burnt lemon tarts and store bought pies is what it looked like to me, and all of it old. Cupcakes and cakes were way too dry and cookies are in baggies and you can't see them. Oh well, Salem still needs a good bakery. The place is nice, but a little snooty. I was wearing my usual warm weather cargo shorts and sandals which raised the eyebrows of several of the blue haired ladies who had obviously gotten all gussied up to see and be seen here. The mature crowd comprised the lion's share of the clientele. I ordered their "Market Roast" beef sandwich with coleslaw. I'd been waiting about 15 minutes when my server approached to say the cook had made the wrong sandwich and it would be awhile longer. After another 10 minutes my meal was served. It was made on a diminutive, excessively chewy (maybe a little past it's prime?) baguette with a sliver of cheddar cheese, lettuce and tomato. It was swimming in liquid from the coleslaw. OH YUM! It should have been in a side dish. It took much of my considerable strength to chew this bread. For most senior citizens (and yes, I qualify), the portion sizes are probably just fine, but I would have liked a little more to eat. I'll probably try this place again, but I need a new outfit first. I'm thinking some Goodwill raggedy bib-alls over red long johns. Or, better still, an orange prison jump suit!